Is there a better alternative to Media Sign Pro? Is Media Sign Pro really the best app in Designs and Graphics category? Will Media Sign Pro work good on macOS 10.13.4? Note: Currently available on a buy-one-license-get-one-free promotion. Media Sign Pro needs a review. Be the first to review this app and get the discussion started! Media Sign Pro needs a rating. Be the first to rate this app and get the discussion started! 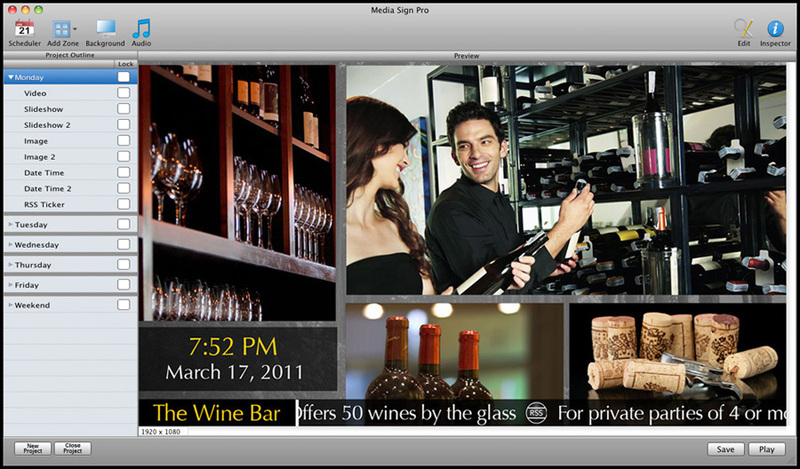 Media Sign Pro is a fully customizable application, and each project can consist of many zone types such as Twitter, video, slideshow, RSS ticker, RSS bulletin, date / time, and more. There are full scheduling capabilities as well at the zone, project, and system levels. Media Sign Pro is most commonly installed on a Mac mini. The Mac mini then gets connected most commonly via HDMI to a display / TV. You then create your project in Media Sign Pro and when ready, click Play, and the project will be displayed full screen. You can also create multiple projects and schedule them. Additionally, Media Sign Pro offers dynamic playlists and files which allow you to update your digital signage project remotely without having to take it out of the "Play" mode.